Earlier this week the Foundation released the Q2 update to the 2016 Equipment Leasing & Finance U.S. Economic Outlook. This popular report provides a comprehensive analysis on key trends, and various industry and external factors likely to impact the $1 trillion equipment finance industry. The latest topical study published by the Foundation dives into the dynamics of the lender finance marketplace in a post-financial crisis world. The study also determines whether banks' appetite to be both a lender and participant in equipment finance business has changed since the 2008 crisis. It also reviews the implications for the equipment finance industry. 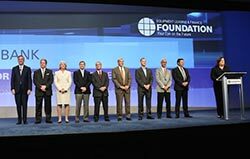 This year the Foundation hosted the 36th annual Industry Future Council Meeting. Industry leaders spent two days discussing current issues, future trends and the outlook for the future of the industry. This report serves as a guidebook to be used by industry leaders as they undertake their own strategic planning. In today's fast-paced world, business leaders require actionable, forward-looking intelligence to make strategic decisions. This handbook will summarize which economic indicators are relevant to leaders in the equipment leasing and finance industry. It also will provide insights on how to leverage economic data and tools published by the Foundation to make better business decisions. The Foundation is seeking articles for the Spring Issue of the Journal of Equipment Lease Financing. The Journal is the only peer reviewed publication in the equipment finance industry and the only one to reach over 12,000 industry participants. Authors should review Journal Guidelines and submit their articles for review by May 5 for the Spring Issue or August 5 for the Fall issue. Foundation Board of Trustees Meeting, May 18th in Washington, D.C.